Transportation Costs > How Much Does a Stop Sign Cost? How Much Does a Stop Sign Cost? 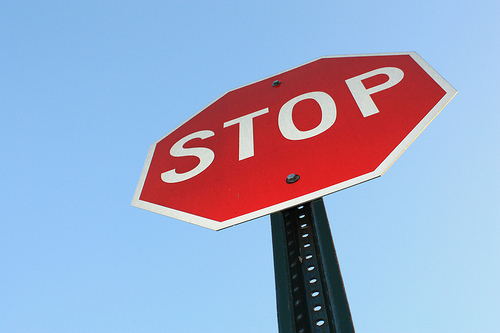 The stop sign is one of the most recognizable signs that is used on the road. Whether you need this sign for private property or as a decoration, the costs will depend primarily on the condition and where it’s purchased from. On average, be prepared to pay around $25 to as much as $150 for a stop sign similar to the one you see on the road. The costs will depend on the reflective grade, the size of the stop sign and where you purchase it. While the sign may not be identical to the one you’re used to seeing, the dimensions, material, and size will be close. USA-traffic-signs.com offers a 24-inch high-intensity reflective traffic stop sign for $50. On the other hand, a 24-inch high-intensity reflective stop sign retails for $70. If you were to hit a stop sign and you were responsible for the bill, the costs could be much more than this due to the labor involved to replace it. On average, if this were the case, you would be on the hook for close to $500 to replace a government-issued stop sign. While the sign itself can cost the government $50 to $75, the labor involved, since it’s billed at $55 to $75 per hour, depending on the area you live in, can increase the costs into the hundreds. Nasdaq, for instance, claims it could cost you $511 if you were to hit a stop sign. In this Lawrence Journal-World article, the city of Lawrence has to pay $50 for the stop sign, but it’s the labor and anchor that makes the sign expensive. These signs, when purchased for personal use will either be made by an engineering grade reflective aluminum, high intensity prismatic reflective aluminum or diamond grade reflective aluminum. Diamond grade, as compared to the other materials, can last up to three to five years longer. Engineering grade reflective aluminum will reflect at night, offering superior brightness at night compared to the standard engineering grade. High-intensity prismatic signs will also reflect at night when the light hits it by using an encapsulated lens material, which can offer a better reflectivity. These signs, when compared to engineering grade, will be 10 times more reflective and can last much longer. Lastly, diamond grade, when compared to the previous two, has the highest degree of reflectivity, offering 10 times more reflective material than standard engineering grade and these signs have a viewing range of 200 to 600 feet. Superior to fading, these signs will exceed most State and Federal D.O.T. guidelines. Typical sizes include 12, 18, 24, 30 and 36 inches. As for the stop sign dimensions, stop signs have a size of 750 mm across opposite flats of the red octagon, with a 20 mm white border. The white uppercase letters in small caps forming the stop legend are 250 mm tall, according to Wikipedia. Mounting holes, unless otherwise stated, will include two ⅜″ holes on the top and the bottom. Due to the larger size, additional shipping fees may be applied, depending on where you purchase it. If you were to buy online, shipping fees could cost another $10 to $30. Plan on replacing a stop sign every seven to 10 years if used outdoors. This length will depend on the materials being used. If the sign is going to be mounted, additional parts such as a pole and a concrete base will be needed. If a contractor needs to install one, plan on budgeting another $200 to $500 to have one installed. Typical poles will be around eight feet tall, and if a pole is not used, there are portable sign bases that can be used as well. If you were to need a contractor, you could receive multiple free quotes from contractors in your area at HomeAdvisor.com. Choose a stop sign that does not fade as highly reflective signs will meet the local state DOT and MUTCD guidelines. Try to stick to the three grades mentioned above and steer clear of the standard engineering grades. Check out Craigslist and eBay. Here, you may be able to find an authentic sign, even if it’s slightly used, for a fraction of the cost. Some companies will offer bulk discounts for those who purchase more than 5 to 10 at a time.